Although I'm a huge fan of spring's little white dress, my clumsy self just can't handle the unforgiving color as blotches of food, wine, and life always end up on the dress creating an accidental Jackson Pollack canvas. 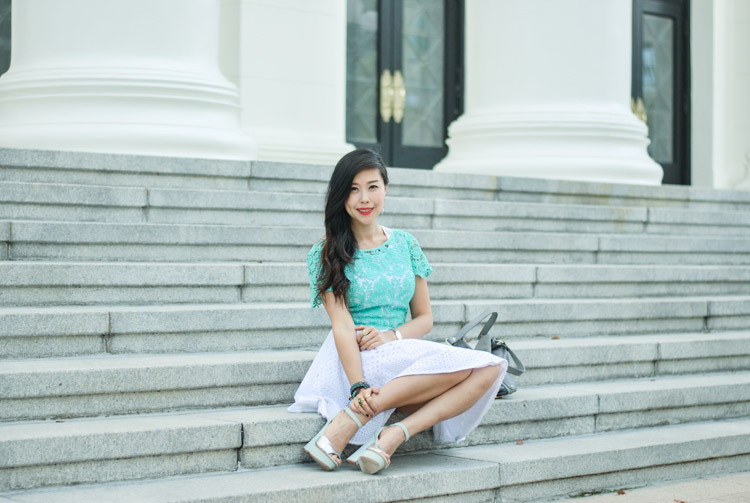 Unable to pass up the opportunity to wear a white dress for brunch on Easter, I'll be layering my bubbly and ladylike Line and Dot white frock with my aqua 2b by bebe lace crop top this Sunday. I'm obsessing over the bright and white color palette as it softly screams spring. The nontraditional mix of lace textures keep the outfit interesting and the look is versatile enough to wear from church to sucking on bone marrow at Church & State. But in all honesty, the lace top can't combat my clumsiness. After all, it has holes everywhere! What I really need is to saran wrap myself from head to toe. But that may cockblock the outfit a bit. Love the lace top over the dress. It really adds something to the simple white dress! Very cute. 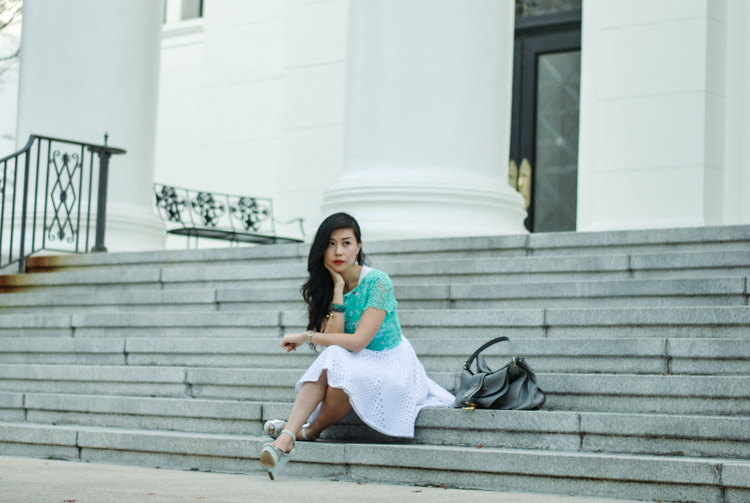 This look is perfect for spring! You're so lucky to live in LA! I'm from Italy and here it keeps on raining =( Btw i read your "about" and i must say you did a great job in your life! I'm now studying japanese at university but fashion is my dream, hope to put them together one day! very pretty! this looks so cute for Spring! Perfect look and fantastic colors! This turqoise & white combination it's absolutely beatiful! The accessories - purse, watch, shoes - are just perfect! I was looking for some time for this kind of inspirational outfits and this is definetly one in the top. Congrats! Stunning!! Loving the mixed textures!! Being a lawyer and being this stylish is a talent. This post certainly inspires me to dress up more. Why can't everyone have money ayayaii!! I love the color of your top- so perfect! Cute, cute dress! i love the combination of both parts. This is such a gorgeous outfit! I love the eyelet dress with the cropped lace top (on top;)! That lipstick color looks so pretty on you! You are look so gorgeous with this outfit, the colour is very nice. 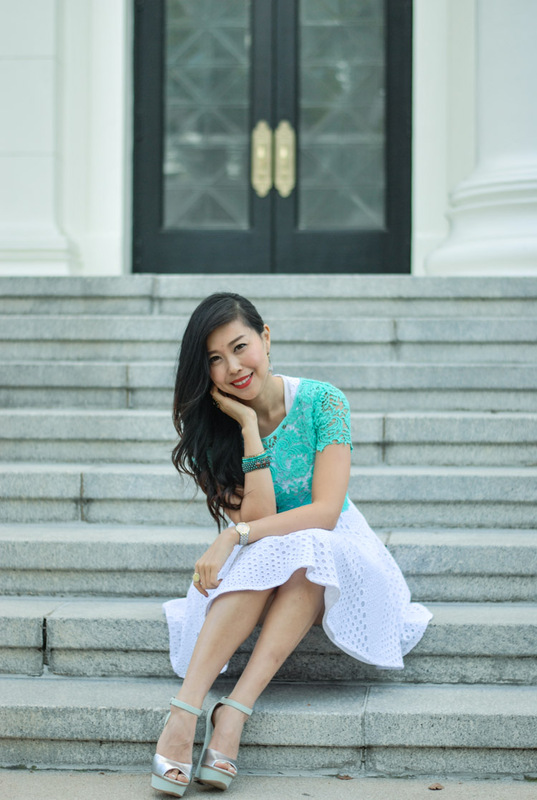 I LOVE that pretty mint lace and the eyelet dress. Great pairing! Gorgeous photos..love the red lip with the mint! I'd love for you to stop by again and enter the impeccable pig giveaway I'm hosting. They have great jewelry!! This has to be one of my favourites of all of your looks!! The colours, the lace! Everything is so beautiful! Thank you for your comment. This is a lovely blog you have here, love this look and outfit, you look great! Darling thanks for your visit and kind comment on my blog!! It needs to be said that you are the reincarnation of Audrey Hepburn! SO CHIC. SO FEMME.